THE CHIEF News Editor of Daily Guide Newspaper, A.R. Gomda, has advised journalism students to inculcate the habit of reading wide in order to become successful in their career. “It is important to read, read, read, read everything. Everything is important in journalism and in life. Just be inquisitive so as to learn and know a bit of everything,” he said. 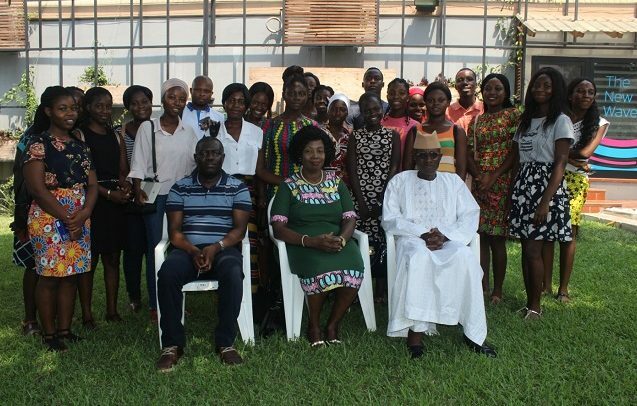 Mr. Gomda gave the advice when he interacted with 20 students from the Ghana Institute of Journalism (GIJ) who visited Daily Guide last Friday to learn about newspaper production. He also educated the students about the pre-computer days of newspaper production, the sources of news, story writing, newspaper design, proofreading and common terminologies in the newspaper industry. The Ag Editor, William Yaw Owusu, while addressing the students shared insight on how news stories are gathered and the importance of reading. Mr. Owusu urged the students to always seek the thoughts of others and to accept criticisms when they are made regarding their reports as journalists. Also addressing the students was Jamila A. Okertchiri, who is now a health reporter at Daily Guide. The award-winning journalist also shared her experiences with the students and urged them to follow their interests for the purpose of specialization. “Inasmuch as you want to do or know a bit of everything, you should have some kind of specialization in a topic when it comes to journalism,” she added. The visit which lasted for two hours saw the students tour Daily Guide’s printing press, including the company’s newly established radio station (Radio Guide) and television station (DGN). Mrs. Heyman Adu, a lecturer at GIJ, who led the students, said the visit was to expose student journalists to practical journalism as well as encourage and inspire them. Mrs. Adu asked the Chief News Editor to consider collaborating with GIJ in the training of student-journalists. “I believe we could collaborate in several ways where Daily Guide would be of help to especially western publications limited. If that is done, our student would be able to benefit,” she added.